Unlike his namesake, Baby's style depicts an image of a typical young man. In the movie, he wears a plain white T-shirt topped with a dark varsity jacket, a pair of skinny jeans, black sunglasses, and dark sneakers. Moreover, the audience can easily points out that Baby never gone anywhere without his iPod and white headphones. If you like to recreate Baby's style, checkout our item list down below! 1 White T-shirt Get a plain white T-shirt to wear. 2 Navy Varsity Jacket Top a T-shirt with a varsity jacket in navy and white colors. 3 Skinny Jeans Pair up you top with a pair of skinny jeans. 4 Navy Sneakers Get a pair of dark sneakers to match with the outfit. 5 Retro Square Sunglasses Get a pair of black retro sunglasses to wear. 6 Fake Scar Wax Create a little scar above your left eyebrow with the special effect wax. 7 White Headphones Use white headphones as a prop (or listen to the music for real). 8 Brown Belt Fasten your jeans with a simple brown belt. 9 Baby Funko POP Figure You're a fan of the film? collect Baby figure now! As for Debora's look, she simply wears a simple black dress covered with a denim jacket, and a pair of dark colored boots. If you like to recreate this duo's style, checkout our item list down below! 1 White Stripped T-shirt As for Debora's costume, pick a white T-shirt with black stripes. 2 Denim Jacket Find a denim jacket to top your T-shirt. 3 Yellow Mini Skirt Match your top with a short skirt in bright yellow, preferably an A-line mini skirt. 4 Long Gray Socks Get a pair of long plain gray socks to wear. 5 Black Boots Get a pair of black boots to match the outfit. 6 Purple Headset Debora is often seen wearing purple headset, so you should get one as well! 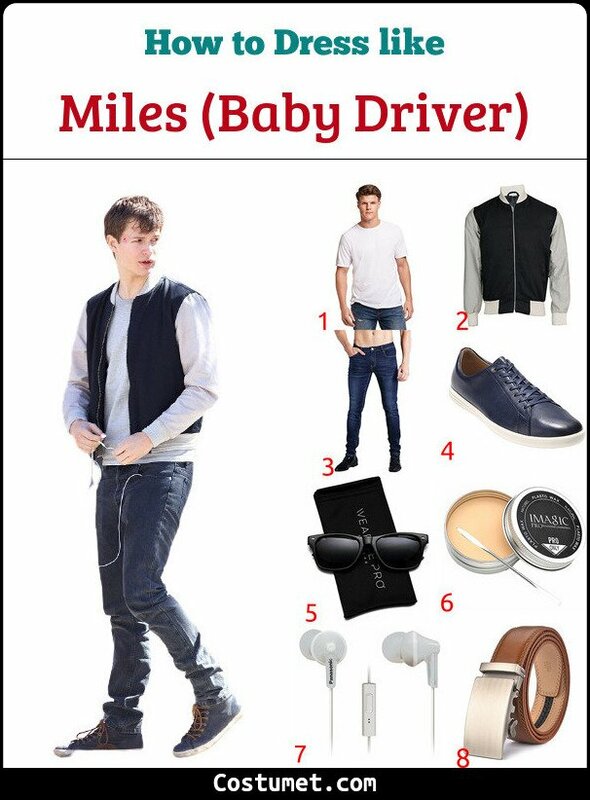 Baby is the main protagonist in Baby Driver, a 2017 heist and action and racing movie that stars Ansel Elgort in the leading role. Working for a crime lord and his organization, Baby is a getaway driver - one of the best. However, Baby feels anxious on the day of the big heist because he knows it's going to fail. And so he makes an attempt to runaway from the heist and the organization for good. At the same time, Baby also falls in love with the waitress named Debra and wants to make a life with her. But there's a long road full of dangers ahead for him to get through in order to flee this criminal life.